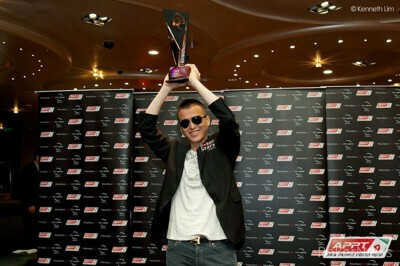 The 2013 APPT Macau Main Event finished last night and Alexandre Chieng won the tournament. The event lasted five days with nine players coming back for the final table yesterday. Chieng ended up running really good when he needed to at the end. For most of the final table Kenneth Leong was in control and held a chip lead over the rest of the table. Leong started the day in the lead and knocked out Khac Tran (9th) early. Once play went 5-handed the remaining players were close in chips. Hong was the next to go after making a huge over bet with Ac/7s. Leong called with pocket jacks and he hit trips on the flop to take a chip lead with just four players left. Leong knocked out Alt next, as he had pocket jacks and hit trips again on the flop. Leong and Chieng dominated the table until action went heads-up. The two players didn’t take long to mix it up and after just six hands Chieng had won the tournament. Leong was all-in and lost with pocket aces against the 7d/6d of Chieng. Scott currently spends most of his time handicapping sports. Scott grew up playing hockey in Toronto and has always had a passion for gambling. Scott has been playing poker since he was a teenager and continues to play in MTT's regularly online at PokerStars. Although his passion is sports gambling he's always following the latest news in the online poker world.